All the bike manufacturers work hard to intend to draw the draw the attention of the motor enthusiasts by producing nevertheless commuters into the market. 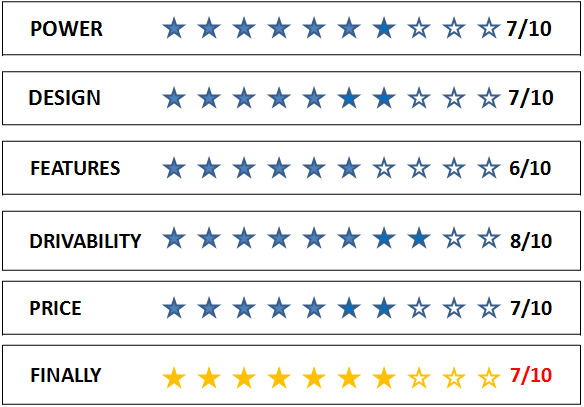 So, the weak point of us is the advantage of the bike producers. So, among the crowded bike makers ‘Ducati’ is one of the finest, costliest bike manufacturer that produces performance oriented bikes into the market. 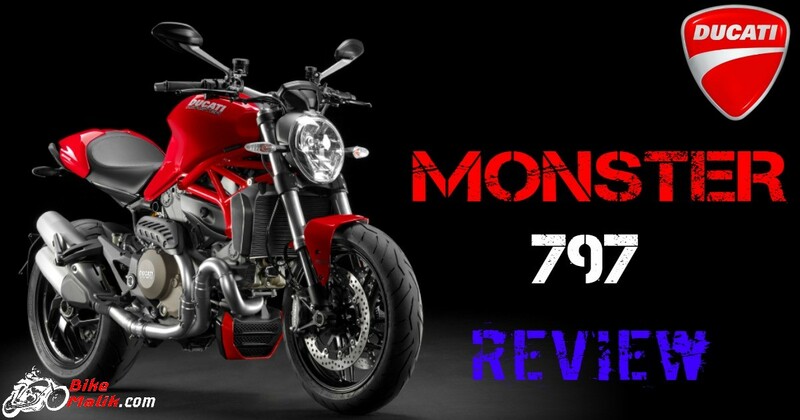 Under the hood, Monster 797 has emerged into the market with expectations at peaks. So, now the question is, do the Monster 797 is a flawless model? Let’s see. 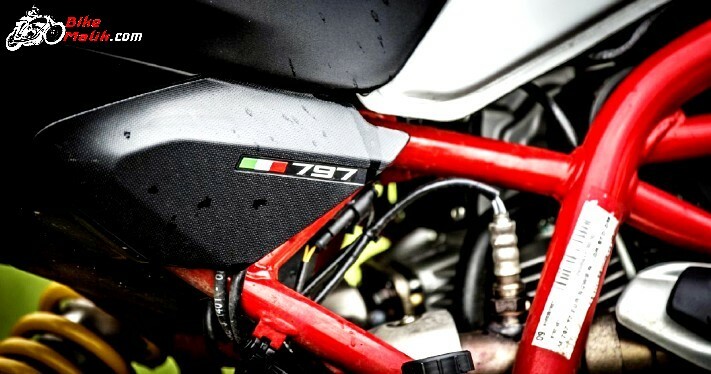 Ducati Monster 797 gets all the power from 803cc L-twin, air-cooled engine churns out a maximum of 74.7Ps of power @ 8,250rpm and 68.8Nm of torque @ 5,750rpm. The powerful execution is enough for the biker to scramble all the surfaces very easily. With the powerful execution and output figures, the bike returns an efficient mileage figure of 18 km/l as per city traffic conditions, while in the highways it claims a 22 km/l. The bike manages to reach 60km/h in just 2.46 seconds while 0-100kmph is claimed in 4.94 seconds. The engine comes mated to a 6-speed gearbox that gives smooth shifting of gears. 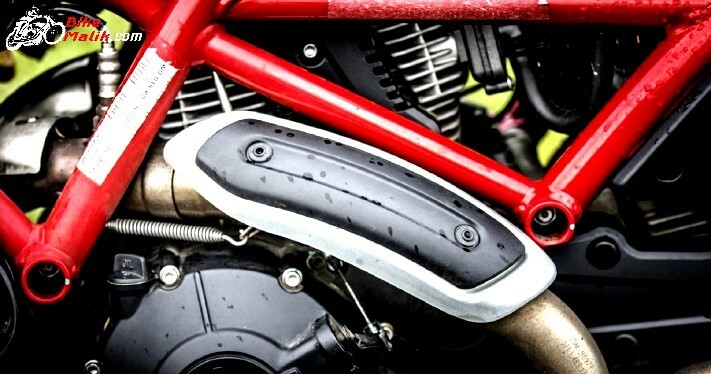 The clutch comes with APTC (Adler Power Torque Plate Clutch), to stop the rear wheel from locking while downshifting and also to restrict the pull effort of the clutch, making it simple for the rider. 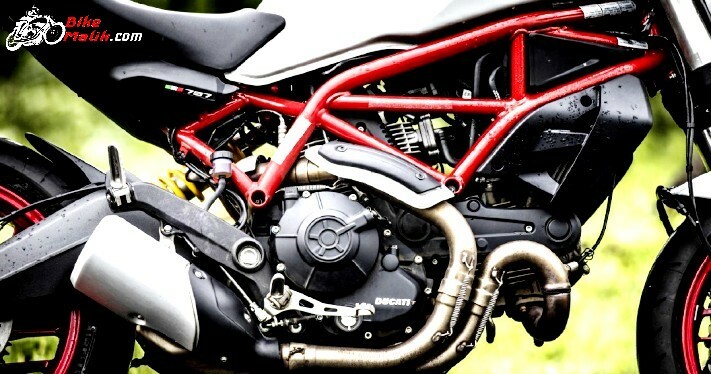 The Ducati Monster 797 carries the same design language as the Monster 821 but some tweaks like 10-spoke alloys, red frame, and a single exhaust canister make the bike a standout model in the market. The nicely cushioned seat height is a comfort and also convenient to the short riders which measure 805mm in dimensions. The 193kg (dry) of weight provides easy maneuvering of the bike, even in hard traffic conditions. The 16.5-litre robust fuel tank gives all the muscular stance to the bike from each & every angle. Coming to the driving dynamics the bike gives all the possible comfort to the extent. As of this, the 120/70 ZR17 front and 180/55 ZR17 rear Pirelli Diablo Rosso II tyres wrapped to 10-spoke wheels prevents the bike from unwanted punctures. The 320 mm dual semi-floating discs mated to a Brembo Monobloc M4.32 callipers at the front and a 245 mm connected to a single piston calliper at the rear gives good braking mechanism to the rider and also stop the bike with effectively with the appropriate application. The bike further gets the Bosch ABS as a standard option which ensures even more safety while braking the bike at high speeds, and thus, skidding of the bike is reduced accordingly. 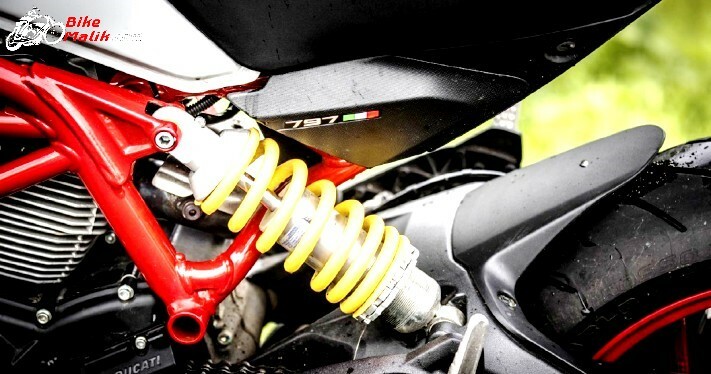 Coming to the Suspension unit, the 43mm Kayaba upside-down forks with a 125mm wheel travel up front and adjustable Sachs mono shock damper with a wheel travel of 150mm at the rear gives stress-free drives to both the rider & pillion. The only lack of the bike is the miss of an traction control and riding modes, which if present gives an unconditional driving experience to the biker & companion. 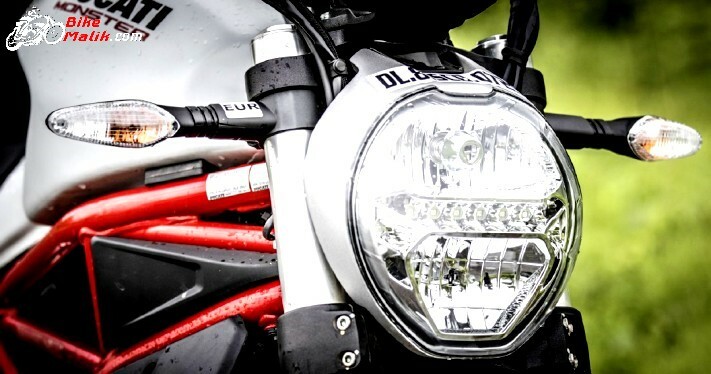 Ducati Monster 797 comes accessible in 1-variants with a price tag that starts at INR 8,88,248 (ex-showroom, Delhi). 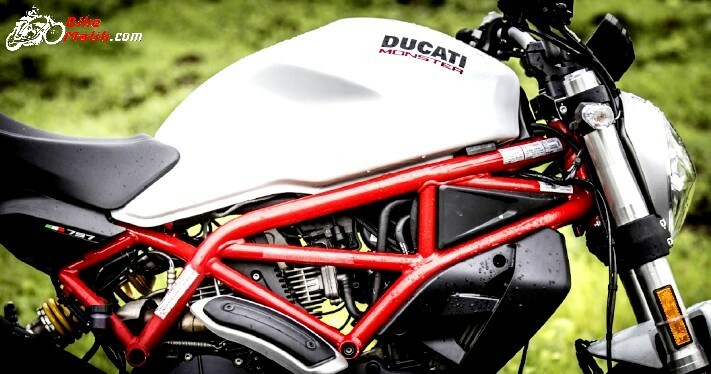 Taking categories into consideration, Ducati Monster 797 is the decent commuter with all the reliable features & offers. The powerful execution is enough for the motor enthusiasts and thus the no awful rides are experienced by the biker. 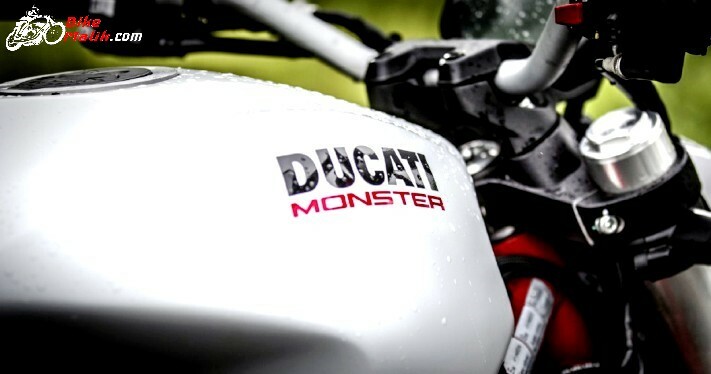 As for the pricing, it is not the cheap model, but it’s just an affordable model in the Ducati lineup. So, if you want to take home a naked commuter with low price, then it’s not a right model as compared to the Triumph Street Triple S, Kawasaki Z900.